Alvin F. de Levie, an avid supporter of the Special Olympics, volunteered at the 2018 Paterno Family Beaver Stadium Run this past April. — Alvin F de Levie, Esq. PHILADELPHIA, PENNSYLVANIA, UNITED STATES OF AMERICA, July 6, 2018 /EINPresswire.com/ -- Alvin F. de Levie, Esq. has been an avid Special Olympics supporter for 30 years, volunteering quite often during that time period. In preparation for this year’s USA Special Olympics, held in Seattle, de Levie sponsored the Paterno Family Beaver Stadium Run. Fundraising events, like the Paterno Family Beaver Stadium Run, all contribute towards sending more Pennsylvanian Special Olympic athletes to the Special Olympic Summer Games. Special Olympics PA provides adults and children with intellectual disabilities training and competitions year-round. Fundraising is essential to the continuing success of the SOPA, being all training and competitions are provided free of charge to all athletes. Thanks to sponsors, such as de Levie, the Special Olympics PA has been able to send athletes to participate in the USA Summer Games. This year, the USA Summer Games take place in Seattle, July 1st-6th. The USA Summer Games are held every four years for more than 4,000 athletes along with their coaches. The Special Olympics will be celebrating their 50th Anniversary of events during the games as well. All athletes will compete in a variety of sporting events. These 14 different events include basketball, soccer, bowling, etc. The main goal of the sporting events is to empower those with intellectual disabilities as valued members of society. The Special Olympics continues to fight against stigmas negatively associated with those who are intellectually disabled. De Levie is an active supporter of the Special Olympics. He strongly believes in the principles and mission they set forth for all participants and volunteers. Since first volunteering 28 years ago, de Levie says there was no turning back. He has made it his own mission to sponsor and support charities including and involved with the Special Olympics. You can find de Levie’s name amongst an impressive list of sponsors for The Paterno Family Beaver Stadium Run. 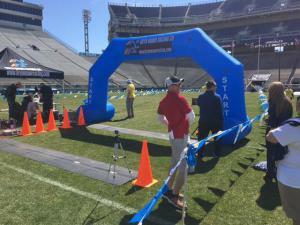 The Paterno Family Beaver Stadium Run took place on April 22nd at Penn State’s Beaver Stadium with more than 3,500 runners and walkers participating. Participants had a choice between a 5K run or a 2-mile family fun walk. Regardless of which was chosen, all participants were benefitting nearly 20,000 adults and children suffering from intellectual disabilities. All proceeds also benefit the Special Olympics Pennsylvania. Even if you are not able to actively participate in the run or walk, there were other ways to show support at this annual event. People could get involved by sponsoring a runner, volunteering at the event as Alvin did, donating money, or even by being a virtual runner. What is a virtual runner? This new twist on the event meant you were able to complete the run virtually anywhere, while still being part of the Paterno Family Run. You could use a treadmill, a track, or even just your neighborhood to walk your choice of mileage. You will still receive a t-shirt regardless of where you participate. De Levie would like to send all athletes and coaches involved in this year’s Special Olympics well wishes, much luck, and happiness while competing in Seattle this week. The 2018 Paterno Family Beaver Stadium Run. Alvin F. de Levie, an avid supporter of the Special Olympics, volunteered at this event this past April.